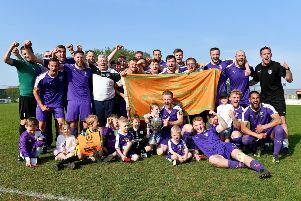 Arron Parkinson believes Daventry Town are firmly in the driving seat in their pursuit of the ChromaSport United Counties League title. The division one leaders travel to Thrapston Town tomorrow (Friday) night looking for another three points to extend their advantage. Town go to Thrapston on the back of a seven-goal thriller with title rivals Olney Town who arrived at Communications Park in third place before going down 4-3. Player-manager Parkinson said: “Winning Saturday’s game gives us a little bit of breathing space going into Friday night’s fixture at Thrapston. “A win there would see us go nine points clear and continue to increase the pressure on the sides chasing us. “But Thrapston will be a tough place to go and we expect a really tough encounter as their home form is very good. Town go to Thrapston without Damon Herbert and possibly Aaron King but Phil Cassidy comes back into the squad along with Dean Lukeman. Buckingham beat Bugbrooke to move up to second but Wellingborough Whitworths remain Town’s biggest threat to the title. Although eight points behind they have a game in hand and will now visit Communications Park on Saturday, March 25, which is ex-players day at the club. Looking back on last weekend’s 4-3 thriller with Olney, Parkinson added: “It was a cracking game of football and a great all round team performance which saw everybody make a contribution. The condition of the pitch was poor but at times we played some really attractive, creative football. “Two well-taken goals from Alfie Taylor, who had his best game for me in a Daventry Town shirt, and one from the tireless Adam Confue and the tricky Adam Creaney was enough to win it.